You may be familiar with the image of the Mad Hatter in the book Alice in Wonderland. The Mad Hatter was mad because of mercury poisoning. Hatters of old used mercury in the making of their hats, and the mercury caused dementia. Mercury is a neurotoxin. It gets into neurons in your brain and disupts them, kills them and causes other forms of neron damage. Unbelievably small amounts of mercury are enough to cause damage. Mercury stays in the human body for years. In other words, it accumulates in your body. So tiny amounts of exposure can add up to the point where it causes serious damage. Get rid of the mercury thermometer. Replace it with a liquid crystal, electronic or infrared thermometer. 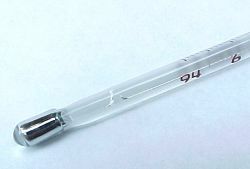 If you happen to break your mercury thermometer, you should be extremely careful around the spilled mercury. Do not touch it. Ventilate the area to eliminate the accumulation of mercury vapor. DO NOT VACUUM MERCURY, as the vacuum cleaner will spread mercury vapor. It would be best to call the poison control center and ask for their recommendations on removal of spilled mercury. See this page for details. Do not allow your dentist to use mercury amalgam fillings on your child's teeth. Be mindful of the amount of fish your child is eating. See the links below for details.